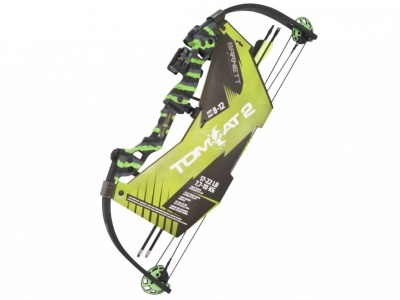 The Tomcat™ 2 compound bow is designed for young archers ages 8 through 12 who are taking steps to progress their skills. Constructed to meet both ATA and AMO standards, the Tomcat 2 meets the mark in accuracy and precision, while still maintaining a manageable 17- to 22-pound draw weight. This right-handed bow comes complete with a 3-pin fiber optic Brightglo sight, soft-touch finger rollers and two arrows. Draw length is 20 to 22 inches with 60 to 70 percent let off. 20-22 draw length, adjustable in 1 increments. 3 pin fibre optic Brightglo sight. Includes finger rollers and two arrows.